Starting with the one fertilized egg that we all once were, embryonic development is made of cell divisions and most importantly of cell decisions. These first life decisions are the first steps of the development of various cell types, which will further divide, decide, specialize, organize, form specialized organs and ultimately an entire very complex human being. Being able to understand how these very early decisions are made is of course a matter of scientific fascination. One of the very first specialization steps is the formation of the trophectoderm versus the inner cell mass. The trophectoderm (marked by the protein cdx2) will form the extra-embryonic tissues such as the placenta. The inner cell mass (from which are derived embryonic stem cells) will become the fetus itself. Within the inner cell mass, further cell divisions and decisions will form the epiblast (marked by the protein nanog) and the primitive endoderm (marked by the protein Sox17). The epiblast will become the fetus itself and the primitive endoderm will play a key role in supporting the next steps in development of the epiblast. 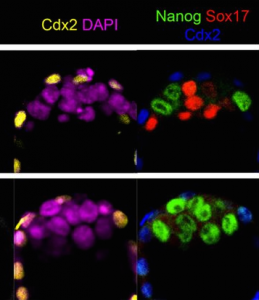 In a recent study published in Development, Bessonard and colleagues showed that the protein Gata6 is necessary for the formation of the primitive endoderm. They combined these observations with additional published data to develop a mathematical model that can recapitulate cell behaviors observed experimentally and describes the temporal dynamics of inner cell mass differentiation. In the upper row of this picture, you can observe a 3.75 days old normal mouse embryo. In the lower row, you can observe a 3.75 days old mouse embryo in which the protein Gata6 was removed. Cdx2 (in yellow on the left and in blue on the right) mark cells of the trophectoderm. Violet cells (DAPI, which marks DNA) are cells of the inner cell mass. These can be divided in cells of the epiblast (marked by nanog, green) or cells of the primitive endoderm (marked by Sox17, green). You can observe that in the absence of Gata6 (bottom row), only epiblast cells that express the protein nanog are formed, confirming the current hypothesis that Gata6 is necessary for the formation of the primitive endoderm. Interestingly, Bessonard and colleagues used these observations, went further and pooled forces with mathematicians to create a mathematical model with which they could describe and predict the early inner cell mass fate decisions. Beautifully, that highlights how joining strengths of different scientific fields is becoming key to further the understanding of the most fascinating biological process of all...development.